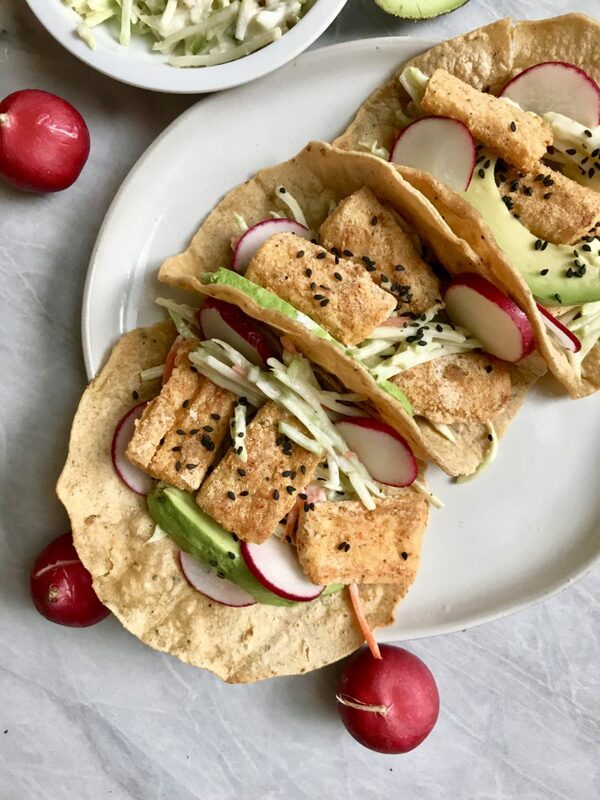 Spice up your Taco Tuesday’s with these delicious crispy hearts of palm tacos. The best part? They are baked! 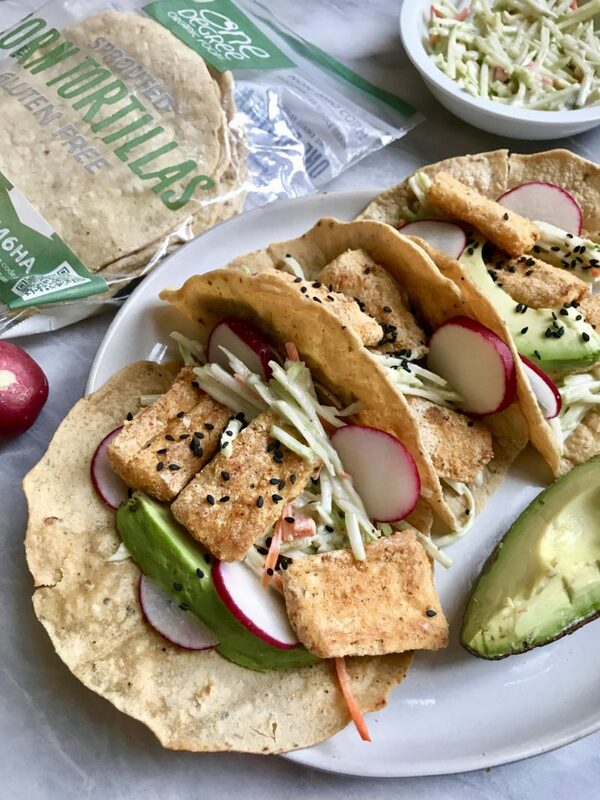 Tacos are great for any time of year, which is why I am so excited to be sharing this recipe with you! 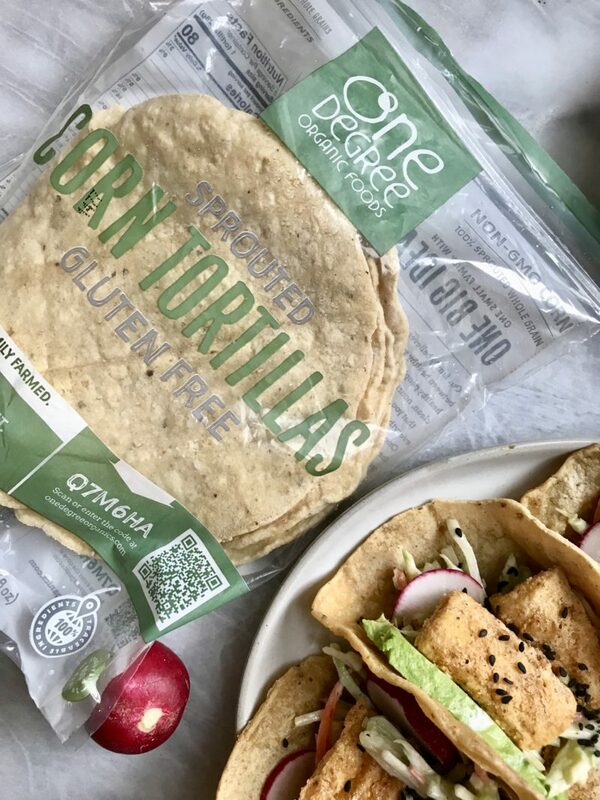 These crispy hearts of palm tacos are crusted with cornmeal giving them such an amazing flavor and texture, without having to be fried! 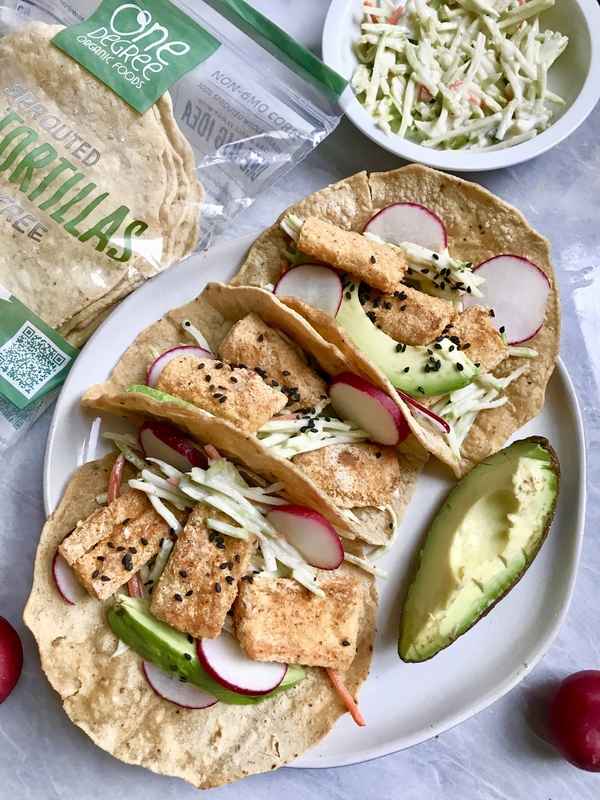 I also layered the tacos on a slaw mixture that is super creamy and compliments the texture of the hearts of palm perfectly! 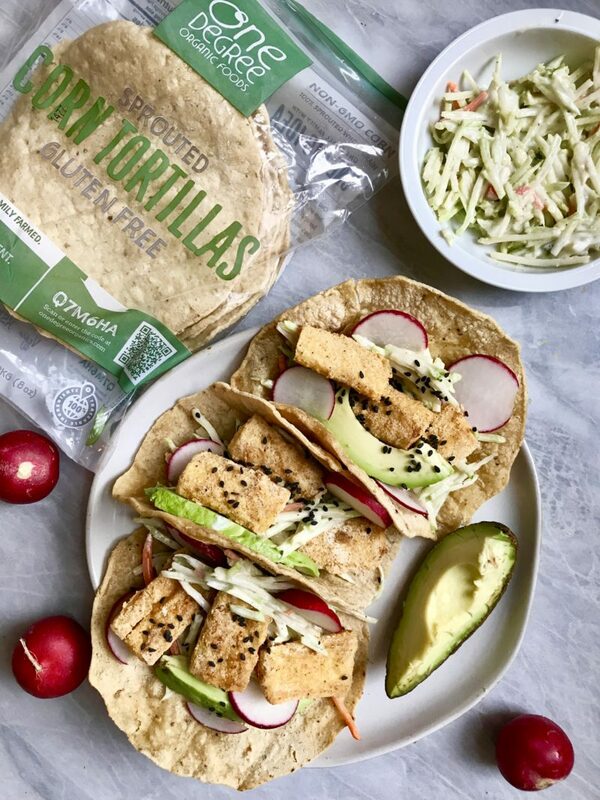 I decided to make this recipe entirely gluten free because I used these absolutely delicious Sprouted Gluten Free Sprouted Tortillas by One Degree Organics. One Degree Organics is a small family owned business who thrive in sustainability and local foods. Their goal is to bring food straight from the farm into your kitchen. What I love about One Degree Organics is that they have a code traceable on the front of the packaging (pictured below) in which you can check out their website and track exactly where those ingredients came from. Their website also lists all the farmers and suppliers that they get their ingredients from. You can learn more about each farmer and supplier specifically by clicking on their picture. It is really interesting and awesome how dedicated One Degree Organics is to building relationships with their suppliers while allowing their customers to get to know them as well. One Degree Organics also make many other products such as cereals, hot cereals, bread, seeds, granolas & flours. I eat their granola by the handful! It’s AMAZING! I hope that you enjoy this recipe! If you make any of my recipes, don’t forget to tag me on Instagram @plantbasedjane so I can see! Drain and wash your hearts of palm. Cut them lengthwise and then each in half. Combine your cornmeal and flour into a bowl and set aside. Pour your milk into a separate bowl. Line a baking sheet with parchment paper and begin coating your hearts of palm. Dip your hearts of palm into your plant milk and then add it to your cornmeal/flour mixture. Add that to a baking sheet. Repeat until all of your hearts of palm are coated and placed onto the baking sheet. Spray your hearts of palm with some non stick oil spray to allow them to get extra crispy in the oven. Bake them for 20 minutes, flip and spray the other side with oil, and cook for another 20 minutes. Meanwhile, make your slaw. Combine all your slaw ingredients and mix to combine. When your hearts of palm are done, assemble your tacos! Lay your tortillas out and spread slaw evenly and top with your hearts of palm and radish. Serve!